The Republican Party platform, posted last week, gives the American-Israeli relationship considerable space. Pundits in the U.S. and Israel have duly noted the absence in the platform of any reference to a “two-state solution”—a phrase that appeared in the 2012 Republican platform but has now become identified with the Democratic Party and the State Department tenures of Hillary Clinton and John Kerry. Republicans are by inference rejecting the elusive “two-state solution,” though both the Israeli and Palestinian governments endorse the concept—though not, it seems, its implementation. To students of the intersection of religion and politics what is most striking in the Republican platform is the strong religious language describing Jerusalem as “the eternal and indivisible capital of the Jewish state” to which the U.S. embassy should be moved from Tel Aviv. This phrase, with its direct echoes of Benjamin Netanyahu’s pronouncements, was missing from the 2012 platform. Equally significant in the Republican platform is the thus far unremarked upon assertion that “support for Israel is an expression of Americanism.” Like the platform’s language about Jerusalem, this elevates the relationship with Israel from the realm of the political and diplomatic to the realm of eternal verities and, one may say, to the realm of theology. One would be hard pressed to find a better representative of that “eternal” and “biblical” approach to Israel and to other burning American issues now dividing the country than Governor Pence of Indiana. Seen from a religious studies perspective, Pence’s elevation to the rank of vice-presidential candidate seems much more serious and weighty than a last-minute choice that Trump allegedly tried to undo at the last minute. As Trump’s choice of Mike Pence came only three weeks after Trump’s 21 June meeting with nearly one thousand conservative Christians in New York City, the decision and its wider implications call for careful analysis. At the conclusion of that 2014 visit Pence recorded a video message to Netanyahu in which he promised to continue the “partnership” with Israel. “I would pledge to you from my vantage point in the heart of the heartland … that not just during this very special time of the year for people who share my tradition, but all throughout the year, that an appreciation for the state of Israel and the partnership between the state of Israel and America has never been stronger,” Pence told Netanyahu. Mike Pence’s conversion story bears telling here: raised in a Catholic family he found the Catholic Church of the 1980s too liberal and sought a more rigorous theology and practice. 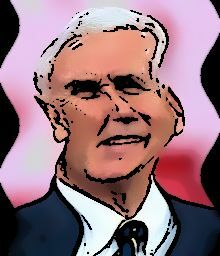 Christian Reconstruction provided the structure he sought, and the supporters of that ultra-conservative ideology helped propel Pence into Indiana politics. As religion scholar Julie Ingersoll noted in her 2015 book Building God’s Kingdom: Inside the World of Christian Reconstruction, this branch of evangelical thought advocates “dominion theology,” a biblical worldview that points to the ways in which humanity is to exercise dominion over creation, and especially over people for whom they deem themselves responsible. Under the intellectual and organizational leadership of Rousas John Rushdoony (1916-2001), Reconstructionists, in Professor Ingersoll’s words, “laid an intellectual foundation that would shape the twenty-first century Christian subculture, developing what would become the religious right’s critique of the American social order, and plotting strategies to bring about change.” Rushdoony advocated the institution of “Biblical Law” in the U.S. “You can have two kinds of law,” he told an interviewer. “Theonomy—God’s law. Or autonomy—self-law. That’s what it boils down to. And autonomy leads to anarchy, which is what we are getting increasingly.” To counter this “anarchy,” Rushdoony advocated a very long-term plan, one that promoted Christian home schooling as an alternative to “Godless public school education.” Though his ideas might sound very abstract to those not theologically oriented, they take on a greater reality and urgency when we look at the support currently given this movement by the Koch brothers and other funders of the Christian right. Denominational labels seldom transfer well across religious boundaries. The Reformed churches, for example, have little in common with Reform Judaism, and the Jewish Reconstructionist movement is in many ways the diametrical opposite of Christian Reconstructionism. The Jewish movement, with its emphasis on Jewish peoplehood and the progressive and pragmatic ideas of Rabbi Mordechai Kaplan, is the most liberal of American Jewish denominations. Christian Reconstructionism, on the other hand, is the most conservative of evangelical movements. But at the current strange political moment these radically different movements, one Christian, the other Jewish, both profess loyalty to Israel and its government. And that profession of loyalty, often expressed as “love of Israel,” has become the most powerful cross-denominational factor in contemporary Jewish life. To move from the abstractions of religious thought to the political arena: CNN’s Dana Bash has reported that Trump was so unsure about Mike Pence that at midnight on Friday he asked top aides if he could get out of it. But I think that this is a bluff: from the standpoint of appeal to evangelicals, Pence is a brilliant choice. And I would make a similar claim about the joint appearance of Trump and Pence on 60 Minutes on Sunday night. Pence may have acted like the silent and meek partner, but in the larger scheme of things he is the important player. So, while Donald Trump plays the clown—or the arrogant aspirant to the monarchy—Mike Pence and his supporters, energized by a deeply conservative theological-political agenda, are now a step closer to the corridors of power. And for many who share Pence’s political agenda, professions of loyalty to the State of Israel and its “eternal and indivisible capital” seem to have talismanic power. Shalom Goldman is Professor of Religion at Middlebury College. His most recent book is Jewish -Christian Difference and Modern Jewish Identity: Seven Twentieth-Century Converts (Lexington Books, 2015). It is currently featured in the Patheos Book Club.